Wow! 2013 is half over. It is hard to believe that Full Moon Farm is 11 years old this year. In those 11 years, I have seen many changes on this mountain. Our road was paved. Our Fire Department went from all volunteer to manned 40 hours per week. The road name changed. 911 emergency allowed the naming of my driveway, since it served more than one property. Three subdivisions have cropped up. Extended periods of rain have caused erosion problems for the driveway and our culverts for the creek. (See Wish List Story.) Wonderful new neighbors too! Many changes have come to the organization too, as names and faces have come and gone, both two legged and four legged. Full Moon Farm has gone from a backyard hobby to a non profit corporation, with an active and knowledgeable board of directors, including our veterinarian, and business people. We are a 'Silver Participant' with Guidestar, www.guidestar.org, a member of the Black Mountain/Swannanoa Chamber of Commerce, www.blackmountain.org, and a member of the Florida Lupine Association, www.floridalupine.org. Starting next month, we will have a new column, the Caretaker's Corner! We have asked our caretaker, Nathaniel Tingle to provide updates on the animals that we can share with you. Nathaniel is an integral part of Full Moon Farm, and has been associated with the Farm since 2011, working with the animals and grounds maintenance. The Caretaker is the pulse of this organization, and we are grateful for his hard work on behalf of the residents here. As we wind down our fiscal year, and head into the end of the calendar year, I want to thank each and every supporter, volunteer, crossposter and board member for their service to the animals. Without all of you, Full Moon Farm would not have had the opportunity to grow and thrive. 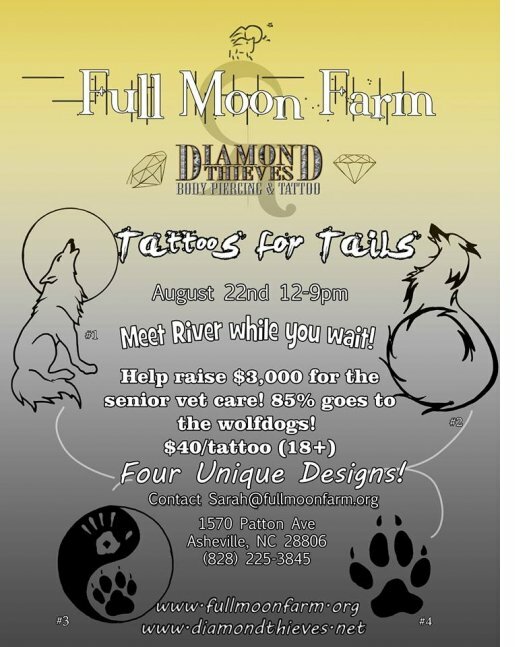 Join us on August 22nd for our Tattoos for Tails Event! Unlike most days at Rainbow Bridge, this day dawned cold and gray, damp as a swamp and as dismal as could be imagined. All of the recent arrivals had no idea what to think, as they had never experienced a day like this before. But the animals who had been waiting for their beloved people knew exactly what was going on and started to gather at the pathway leading to The Bridge to watch. It wasn't long before an elderly animal came into view, head hung low and tail dragging. The other animals, the ones who had been there for a while, knew what his story was right away, for they had seen this happen far too often. He approached slowly, obviously in great emotional pain, but with no sign of injury or illness. Unlike all of the other animals waiting at The Bridge, this animal had not been restored to youth and made healthy and vigorous again. As he walked toward The Bridge, he watched all of the other animals watching him. He knew he was out of place here and the sooner he could cross over, the happier he would be. But, alas, as he approached The Bridge, his way was barred by the appearance of an Angel who apologized, but told him that he would not be able to pass. Only those animals who were with their people could pass over Rainbow Bridge. The Rainbow Bridge has been a busy place. It is with a heavy heart that we report two of our senior animals made the journey over the Bridge. Ms. Tala, the last of the Omaha 7 was assisted in her transition by Dr. Beverly, after the diagnosis of congestive heart failure. The Omaha Rescue took place in March of 2003. Mozart, one of our newest arrivals made the transition on his own, and went in his sleep, overnight. He and Yaqui were rescued in January of this year, and were in terrible shape. The Dr.'s at Animals R Us did not think that Mozart would make it, as his body condition was poor, his hips the worst they had ever seen, and they both were heart worm positive. We promised them 6 months of all the food they could eat, and medications to ease the chronic pain, and all they love they wanted and needed. Well, Mozart took that 6 month promise to heart, as he chose to leave this earth at the 6 month mark. Yaqui has been moved up top for a change of scenery, and has adjusted to life without his sidekick. 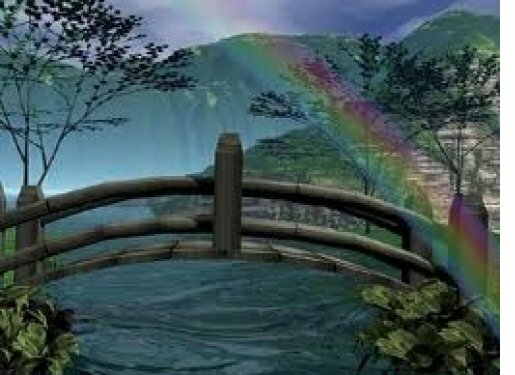 The Rainbow Bridge story above always makes us cry for the ones that we could not save. Tala and Mozart did not die unloved or alone. We are sure both were restored to their youthful vigor and have joined the Full Moon Farm pack, running without fences. Mournful howls from the mountain. The Farm is in need of one of more self contained camper trailers, 19 feet or longer for housing interns and a co-caretaker. Donations are tax deductible to the extent of the IRS Code. We are in desperate need of a decent running vehicle. The 1999 pick up has been rebuilt 3 times, and has 256,000 miles on it. It is our only 4WD vehicle, which is necessary on this mountain. The 2001 3500/1 ton van has 248,000 miles and is our primary vehicle. It transports animals to the veterinarian, picks up dog food and fencing materials. and picks up all the new rescues. Please, your tax deductible donation of a 4WD pick up truck, a van with rear air, or a Ford Transit would be appreciated. Driveway Repair and/or paving! These record breaking rains have taken a toll on our driveway. The estimate to repair all the rain damage to the driveway and the upper culvert above the cabin, is $2900.00, which our general budget just cannot absorb. We are looking for the donation of grading and/or paving. Tree work. We still have numerous 'widow makers' hanging in our trees, and need experienced help clearing them out. Any tree folks out there? 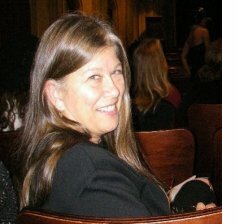 Donate your services for a tax deduction! Website Work. 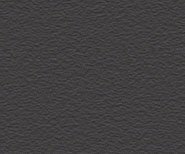 Familiar with Joomla and Volusion software. We are always grateful and thankful for new ideas, for volunteers and for donations of all kinds. Please contact Contact nancy@fullmoonfarm.org or 828-664-9818 if you have any questions or need additional information. WLOS Charity Challenge - WE WON! 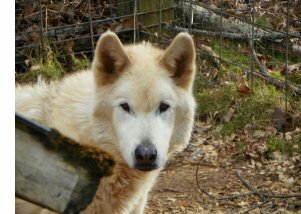 Aslan came to Full Moon Farm in the summer of 2010 with 16 other woofers. There were an additional ten northern breed mixes that were released to other rescues. Her prior life was with a breeder, who, when unable to provide a quality life for her and the others, released them to Full Moon Farm. Aslan had a severe case of tape and whip worms, and was suffering from malnutrition. She was unable to be spayed at the time of rescue as a result of her poor body condition. She has been paired up with Juneau, a neutered male, and they get along famously. We are pleased that the old owner of these animals now volunteers for Full Moon Farm, and has a new understanding of wolfdog phenotyping and husbandry. Aslan’s birthday is April 18, 2007. Sponsorships are an important part of our success. 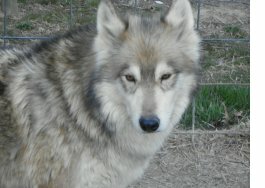 The funds raised in sponsorships help provide food and medical care for the resident wolfdogs. We appreciate each and every one of our sponsors and thank you for everything you do to help us take care of the wolfdogs. Many of the wolfdogs are still in need of sponsors; please let us know if you would be interested in sponsoring one or more of our beloved residents. You can find information on our website for the sponsorship packages but please email us if you have any questions or need further information. We have monthly, bi-annual and annual options available to meet all budget needs! To sponsor an animal visit our website here. Hi, I’m Aslan. I am a pretty, husky mix girl, and when I know you, I will play bow and be silly. If I don’t know you, I will hide from you! 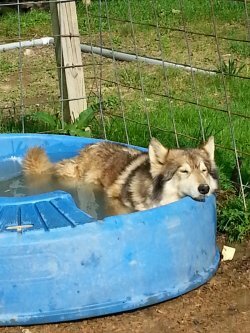 I love to swim in my pool on hot days, aren't I cute? Please sponsor me, so I can get to know you. My picture comes with a certificate! 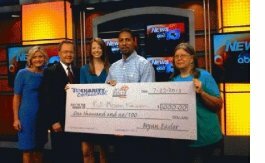 WLOS, an Asheville, NC TV station held a Charity Challenge event. Full Moon Farm was nominated by our wonderful supporters and chosen as one of the final 3 charities to compete in the event! We would like to thank each of you who took the time to nominate us and we were delighted that we were chosen to be one of the finalists for the vote. But we were extremely excited and humbled when we actually WON! Thanks to each of you who VOTED for us! 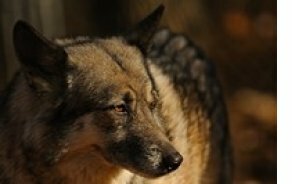 We owe it to each of you for your belief in our mission and your continued support of the sanctuary and the resident wolfdogs. Without you we would not be able to continue! Thursday, August 15, 11a to 9p - Dog Days of Summer at Mayfel's in Asheville. River will be walking Nancy around downtown, and we will have a small info table with some merchandise for sale. Very dog friendly, too! 10% of the day's proceeds are donated to us, so come by to see us while you enjoy lunch or dinner! Sunday, August 25- Rafting with River! at French Broad Rafting Company in Walnut, NC- $40 per person, pre-pay, details soon to be announced! The July Facebook Auction benefitting Full Moon Farm was spectacular, even better than expected. There were some great items available with donations from a variety of people and businesses! We are currently planning on hosting another one later in the year; keep an eye out on it as we are sure there will be some fabulous items in that one too! The Scentsy fundraiser was a success; we had some awesome support by you all in that one. We will be holding another one for Scetsy items later in the year as well, so if you are interested please keep an eye out for it! We have a few planned fundraisers that will be coming your way soon to include one with Becky’s Ceramics, Silpada silver jewelry, Scentsy, Tastefully Simple, a new and improved auction event, and others as the details become finalized. Don’t forget about the Bissell Partners for Pets, Antlerz and BarkBox programs that help to raise donations for Full Moon Farm as well as iGive and GoodSearch (Shop, Search and Play Games to earn donations to the sanctuary) We have some exciting opportunities for you all coming up! If you would like to be notified of new fundraisers as they are ongoing or would like more details on any particular one or event please send me an email to jenniferp@fullmoonfarm.org and I will be happy to help you!